صفری, مجتبی, بیگلری, حسن. (1395). بررسی ارتعاش استهلاکی وابسته به فرکانس تیر ساندویچی مرکب با هسته‌ی ویسکوالاستیک و انعطاف‌پذیر جانبی بر مبنای روش GHM. 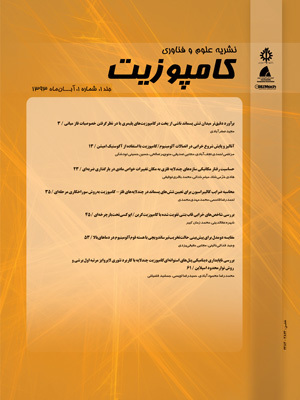 علوم و فناوری کامپوزیت, 3(4), 397-408. مجتبی صفری; حسن بیگلری. "بررسی ارتعاش استهلاکی وابسته به فرکانس تیر ساندویچی مرکب با هسته‌ی ویسکوالاستیک و انعطاف‌پذیر جانبی بر مبنای روش GHM". علوم و فناوری کامپوزیت, 3, 4, 1395, 397-408. صفری, مجتبی, بیگلری, حسن. (1395). 'بررسی ارتعاش استهلاکی وابسته به فرکانس تیر ساندویچی مرکب با هسته‌ی ویسکوالاستیک و انعطاف‌پذیر جانبی بر مبنای روش GHM', علوم و فناوری کامپوزیت, 3(4), pp. 397-408. صفری, مجتبی, بیگلری, حسن. بررسی ارتعاش استهلاکی وابسته به فرکانس تیر ساندویچی مرکب با هسته‌ی ویسکوالاستیک و انعطاف‌پذیر جانبی بر مبنای روش GHM. علوم و فناوری کامپوزیت, 1395; 3(4): 397-408. در این مقاله، پاسخ دینامیکی تیر ساندویچی مرکب با هسته‌ی ویسکوالاستیک و انعطاف‌پذیر جانبی با شرایط تکیه‌گاهی ساده به‌صورت تحلیلی بررسی شده است. برای تحلیل تیر تئوری سه لایه ساندویچی به‌کار رفته است. معادلات حاکم بر مسئله با استفاده از اصل هامیلتون استخراج شده است. به‌دلیل عدم توانایی مدل‌های کلاسیک در توصیف جامع عملکرد دینامیکی مواد ویسکوالاستیک، از مدل GHM برای مدل‌سازی هسته‌ی ویسکوالاستیک استفاده شده است. مزیت این مدل در برگرفتن وابستگی خواص مادی به فرکانس در مواد ویسکوالاستیک می‌باشد. معادلات دیفرانسیل جزئی حاکم بر تیر با استفاده از روش جمع آثار مُدها به معادلات دیفرانسیل معمولی با ضرایب متغیر با زمان تبدیل می‌شوند. حل معادلات دیفرانسیل معمولی به‌صورت عددی با استفاده از روش نیومارک انجام شده است. نتایج تحلیل دینامیکی با نتایج موجود در ادبیات موضوع صحه‌گذاری شده است. نوآوری مقاله حاضر، در نظر گرفتن خواص مادی وابسته به فرکانس هسته‌ی ویسکوالاستیک با استفاده از مدل GHM و انعطاف‌پذیری هسته‌ با به‌کارگیری تئوری سه لایه ساندویچی در تحلیل دینامیکی تیر ساندویچی مرکب می‌باشد. هدف مقاله، بررسی پاسخ دینامیکی تیر با هسته‌ی ویسکوالاستیک طبق مدل GHM و بیان مزیت این مدل نسبت به مدل کلاسیک کلوین- ویت می‌باشد. همچنین به بررسی تأثیر پارامترهای مختلف از جمله ضخامت، چگالی هسته‌ و سفتی رویه‌های تیر ساندویچی مرکب بر فرکانس و نرخ میرایی پاسخ دینامیکی تیر پرداخته شده است. بررسی‌ها نشان می‌دهد، مدل GHM با در نظر گرفتن خواص مادی وابسته به فرکانس مواد ویسکوالاستیک نسبت به مدل کلوین- ویت توصیف دقیق‌تری از پاسخ دینامیکی تیر با هسته‌ی ویسکوالاستیک دارد. In this paper, dynamic response of simply-supported composite sandwich beam with viscoelastic and transverse flexible core is investigated, analytically. Three-layered sandwich panel theory is used to analyze the beam. Hamilton's principle is employed to obtain governing equations of motion. In this paper, GHM method is used to model the viscoelastic core of the beam. Advantage of GHM model in according to classical models is including the frequency dependent characteristic of viscoelastic materials. Modal superposition method is used to convert partial differential equations of motion to ordinary differential equations with time varying coefficients. Newmark method is applied to solve the ODE with a numerical approach. Results of the present model are validated by analytical results published in the literatures. Innovation of this paper is considering frequency dependency of material property in viscoelastic core with using GHM model and utilizing three-layered sandwich panel theory in dynamic analysis of composite sandwich beam. The article investigates the dynamic response of beam with viscoelastic core by using GHM model to illustrate advantages of the GHM model over the Kelvin-Voigt model. As well as, a parametric study is also included in this paper to investigate the effect of different parameters such as thickness and density of core and stiffness of composite sandwich beam face sheets on the beam frequency and damping rate of beam dynamic response. The obtained results show that GHM model by considering the frequency dependency behavior of viscoelastic material presents a more accurate description of dynamic response of the beam with viscoelastic core. Reddy, J.N., "Mechanics of Laminated Composite Plates and Shells: Theory and Analysis", CRC press, 2004. Trindade, M.A. and Benjeddou, A., "Modeling of Frequency-Dependent Viscoelastic Materials for Active–Passive Vibration Damping", Journal of vibration and acoustics, Vol. 122, No. 2, pp. 169-174, 2000. Meunier, M. and Shenoi, R.A., "Dynamic Analysis of Composite Sandwich Plates with Damping Modelled Using High-Order Shear Deformation Theory", Composite structure, Vol. 59, No. 2-3, pp. 243-254, 2001. Meunier, M. and Shenoi, R.A., "Forced Response of FRP Sandwich Panels with Viscoelastic Materials", Journal of sound and vibration, Vol. 263, No. 1, pp. 131-151, 2003. Barbosa, F.S. and Battista, R.C., "A Computational Modeling Of Sandwich Viscoelastic Dampers", Federal University of Rio de Janeiro, Rio de Janeiro, RJ, Brazil, 2004. Hamed, E. and Rabinovitch, O., "Modeling and Dynamic of Sandwich Beams with a Viscoelastic Soft Core", AIAA Journal, Vol. 47, No. 9, pp. 2194-2211 , 2009. Marynowski, K., "Dynamic Analysis of an Axially Moving Sandwich Beam with Viscoelastic Core", Composite structures, Vol. 94, No. 9, pp. 2931-2936, 2012. Mahmoudkhani, S. Haddadpour, H. and Mavazi, H.M., "Free and Forced Random Vibration Analysis of Sandwich Plates with Thick Viscoelastic Cores", Journal of vibration and Controll, Vol. 19, No. 14, pp. 2223-2240, 2013. Won, S.G. Bae, S.H. and Cho, J.R., "Three-Layered Damped Beam Element for Forced Vibration Analysis of Symmetric Sandwich Structures with a Viscoelastic Core", Journal of Finite Element in Analysis and Design, Vol. 68, pp. 39-51, 2013. Filho, W.F. and Barbosa, F.S., "Comparisons of Numerical and Experimental Evaluation of Viscoelastic Sandwich Beams", Journal of Mechanical Computational, Vol. 33, pp. 1543-1555, 2014. Zghal, S. and Bouazizi, M.L., "Model Reduction Method for Viscoelastic Sandwich Structures in Frequency and Time Domains", Journal of Finite Elements in Analysis and Design, Vol. 93, pp. 12-29, 2015. Lakes, R., "Viscoelastic Material", Cambridge University Press, University Of Wisconsin-Madison, 2009. Severino, P.C. M. and Guillermo, J. C., "Computational Viscoelasticity", Computational Mechanics, Federal university of Alagoas, Brazil, 2012. Mctavish, D.J. and Hughes, P.C., "Modeling of Linear Viscoelastic Space Structure", Journal of Vibration and Acoustics, Vol. 115, No. 109, pp. 103-110,1993.